ESPI - Smartphone Street Photography photomeet. Participants could only use their phone cameras and had two hours to roam the City of Malolos to find interesting subjects. Furthermore, there was a theme for the contest : "RED". Their entries are now up for voting. Contest is open to Focus Bulacan official members and applicants. Voting is also open only to members and applicants, plus official guest judge. Only Focus members/applicants/judge's votes will be tallied. There's no specific criteria where to base your vote. Just vote for the photo that you think best captured the essence of the theme and activity (Red, Street Photography). Please view each and every photo before casting your vote. You need to pick three photos. If you name only one photo, your vote would only count for 1 point. Although not required, voters are encouraged to offer constructive critique on their picks. Participants may not vote for their own photo. Self-votes will be nullified and violator's entry will be automatically disqualified. The entry that accumulates the most number of points wins. Use your Facebook account to cast your vote. 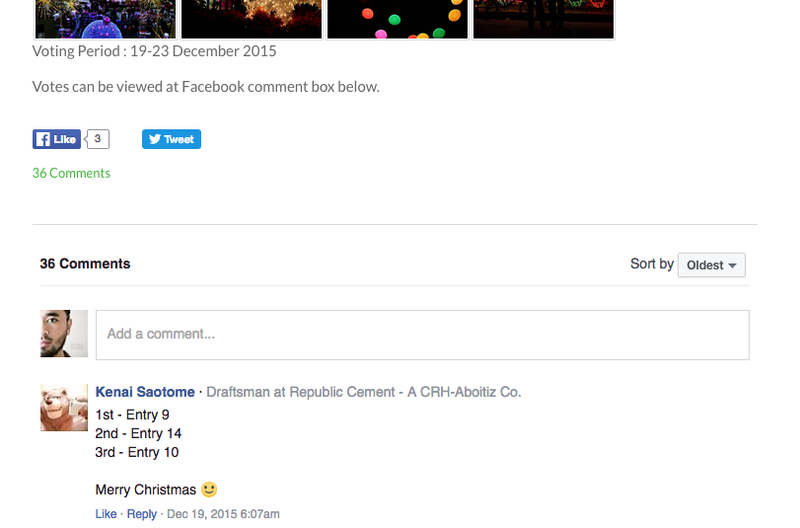 There's a Facebook comment box plug-in at the bottom of this post. State your vote by adding a comment there. To the participants : win the contest thru the merit of your photo, not by other means. Please report cases of vote solicitation or vote influencing by informing Focus Bulacan Competition Officer Jing Calonge. Your report will be handled confidentially. Participants who are found to have solicited or influenced votes shall be disqualified outright from the contest and given a last warning. The next offense shall lead to disqualification from Focus Bulacan's 2019 Competition. Voting ends on Monday, April 29, at 11:59PM. Winner will be announced soon after. 15 entries in all. May the best one win. Thank you for dropping by and chiming in. Especially our guest judge Francis Nollan and Irene Dy. Back in flight! Congratulations, Ry! 1st Place gets an extra 10 points, 2nd Place gets 7, 3rd Place gets 5, 4th Place (undisclosed) gets 3, and 5th Place (undisclosed) gets 2 points for Focus Bulacan's 2019 Photographer Of The Year competition. Participants automatically get 3 points for submitting entries. The form and beauty of nature presented in abstract. Which ones stand out for you, and which did you vote for? Let's find out our winners. Thanks to everyone who voted! He's on fire! We're just in the third month of 2019 and this is already his third contest win. Congratulations, Gerson! 1st Place gets an extra 10 points, 2nd Place gets 7, 3rd Place gets 5, 4th Place (undisclosed) gets 3, and 5th Place (undisclosed) gets 2 points for Focus Bulacan's 2019 Photographer Of The Year competition. Participants automatically get 3 points for submitting entries. There's a time for joy, a time for sorrow, and all the emotions in between. And then there's the perfect moment to capture those emotions. Thanks to everyone who cast their votes! Way to Go, Patrick! Congratulations! 1st Place gets an extra 10 points, 2nd Place gets 7, 3rd Place gets 5, 4th Place (undisclosed) gets 3, and 5th Place (undisclosed) gets 2 points for Focus Bulacan's 2019 Photographer Of The Year competition. Participants automatically get 3 points for submitting entries. Straight out the camera entries. Hats off to the participants for coming up with these compelling stories. After a week of voting, the top photos have emerged. Back to back wins! Congratulations on your hot start, Gerson! 1st Place gets an extra 10 points, 2nd Place gets 7, 3rd Place gets 5, 4th Place (undisclosed) gets 3, and 5th Place (undisclosed) gets 2 points for Focus Bulacan's 2019 Photographer Of The Year competition. Participants automatically get 3 points for submitting entries. Thanks to everyone who gave their votes and determined our winners! Till the next contest. NEW COMPETITION OFFICER : 2018 Competition Officer Jer Sandel has resigned his post and relinquished his officership altogether starting this year. Taking on the role of Competition Officer for 2019 is JING CALONGE. Competition Officer Calonge is not eligible to enter Focus Bulacan's competition. She may, however, join the PhotoWorld Cup competition in representing Focus Bulacan, the Scott Kelby Worldwide Photowalk contest, and other national/international contests that are not organized by Focus Bulacan. Although he is now eligible to join Focus Bulacan's 2019 competition, former Competition Officer Sandel has chosen not to participate this year. However, he may still join the PhotoWorld Cup competition in representing Focus Bulacan, the Scott Kelby Worldwide Photowalk contest, and other national/international contests that are not organized by Focus Bulacan. 2018 PhotoWorld Cup Adviser Joey Ramos is taking on a new role, this time as Externals Officer for 2019. He is still eligible to enter and join the Focus competition, with no restrictions. Theme contests are meant to provide an extra challenge to Focus competition participants on how to interpret themes and execute ideas into photo output. Our theme contest format is retained. Themes will be announced at the beginning of each month. Photo entries must be shot/taken during the same month. Old/stock photos will not be allowed. Theme contests also give an opportunity to Focus members who cannot join PhotoMeets to participate in the competition by shooting on their own. Monthly PhotoMeet contests will continue. Photo entries for these contests will be shot during designated monthly PhotoMeets of Focus Bulacan. There shall be a minmum of nine (9) PhotoMeet contests for 2018 : one for every month except May, July, and December. PhotoMeets could also coincide with special events such as the Scott Kelby Worldwide Photowalk and the Fujifilm Nationwide Photowalk. Each year, Focus Bulacan makes it a point to participate in the Scott Kelby Worldwide Photowalk and the Fujifilm Nationwide Photowalk. They are annual events that are in line with our campaign to make new friends and expand horizons via photography. Both photowalks are followed by photo contests, facilitated by both Focus Bulacan and the organizers of the entire photowalk event. Due to the bigger turnout of participants, we allocate higher contest points to winners of these special contests. Focus Bulacan celebrates its founding anniversary with an annual photo exhibit. Included in this exhibit is a "People's Choice" contest where exhibit-goers vote for their favorite photo. During the latter part of the year, Focus Bulacan has an annual "Focus Portrait Project" where members photograph their co-members. These portraits are entered into a contest. Focus Bulacan aims to promote camaraderie through these contests and special contest points are given to winners of the mentioned contests. Focus Bulacan will again compete in the PhotoWorld Cup - a competition among FPPF-affiliated photography clubs. PhotoWorld contests are judged on-the-spot monthly. There are ten (10) PWC contests for 2019. Higher contest points are allocated to participants and winners in these PWC contests, to encourage participation among Focus members. Purpose. Focus Bulacan’s photocontests are meant to inspire improvement by providing an organized form of objective and subjective evaluation of photos. Photograph entries are individually assessed, then compared to other entries, with these assessments being the basis for voting. The results and feedback of the contests should serve as critique, which in turn would guide the participants as to where improvements should be made in their next photos. Approach. Contests are competitive in nature. Competitiveness - within the boundary of rules, fairness and sportsmanship – spurs improvement. Participants are urged to do their best to win contests while adhering to these guidelines. However, may we remind everyone that there will be winners, there will be losers, yet the ultimate goal is for participants to learn something from the feedback and critique on their photo entries. Winning isn’t everything. Wanting to win AND learning from trying are everything. Methodology. Focus Bulacan contests are open only to official members and applicants. Likewise, only members and applicants are allowed to vote on the photos. Entries will be kept anonymous so as to eliminate bias and make voters assess the photos purely on their merit. Make sure your photos comply with the category or theme of the contest. Only one (1) entry is allowed per participant. Do not put borders or watermarks or any other mark of distinction on the photos. Post-processing is allowed, unless stated otherwise. Creativity doesn’t end at the click of the shutter. However, putting text or borders on the photos are not allowed, unless specifically instructed by the Competition Officer to be allowed for a particular contest. Please resize your entry to 1,000 pixels on the long side. For photomeet contests, entries must be taken on the date of the photomeet. For theme contests, entries must be taken on the same month of the theme. Old/stock photos are not allowed. Entries will be subjected to a vote by official Focus Bulacan members and applicants. Contest organizer reserves the right to ask for RAW copy of the entry, for authentication purposes. Follow contest general guidelines (regarding restrictions and photo resizing). Starting 2019, there will be no more date specifications. Old photos are allowed, except for the May 2019 theme (suprise theme). Infrared and sepia photos are NOT allowed. Cellphone photos are strictly NOT allowed. Drone photography is NOW ALLOWED. Photos that previously won local and/or international awards prior to monthly theme judging will be disqualified. "Kapatid" shots are not allowed to be used by the same photographer who previously used the image; except by other photographers who shot the same photo if it was done at the same time. Photo inspiration is allowed for as long as it was not totally copied. Post-processing is allowed but NO COMPOSITES. Raw/SOOC (straight out of the camera) JPEG copy of entries shall be provided by the participants along with the final output file of the entries. Only one (1) entry is allowed per participant. Each club could enter a maximum of ten (10) entries per theme. Do not put borders or watermarks or any other mark of distinction on the photos, unless otherwise allowed or stated by organizers. Please send HIGH-RESOLUTION copy of your photo entry. We need high-res files of entries, as they will get printed for the FPPF PWC on-the-spot judging . Entries will be screened by a Focus competition committee. Approved entries will be printed and submitted to the national PhotoWorld Cup judging. Keep in mind that you have to submit BOTH your photo entry and its raw file. Incomplete submissions will be disqualified from the contest. Only Focus members and applicants are allowed to join our contests. For photomeet and theme contests : only members, applicants, and guest judges may vote (public voting). For PWC contests, a Focus competition committee will select the entries for submission to the national PWC judging. For 2019 photomeet and theme contests, we will use public comment voting system where votes will be posted as comments on the website contest page. You have to use your personal Facebook account in order to vote. The comment section is at the bottom of the contest page, click HERE to get the idea. We strongly encourage voters to offer critique along with their votes. Voting mechanics are also published whenever a contest is posted for voting. Contest is open to Focus Bulacan official members and applicants. Voting is also open only to members and applicants, plus official guest judges. There's no specific criteria where to base your vote. Just vote for the photo that you think best represents the activity or theme. Participants may not vote for their own photo. Self-votes will be nullified and offender's entry (if he/she has one in the contest) will be automatically disqualified. Use your Facebook account to cast your vote. State your vote in the Facebook comment section at the bottom of the contest page. To the participants : win the contest thru the merit of your photo, not by other means. Voting usually takes a week (7 days), with the winner announced the next day once voting ends. Soliciting or influencing votes is strictly prohibited. Do not ask voters to vote for your entry or influence them to do so by showing them your entry. Keep your entry anonymous as much as possible. Proven cases of vote solicitation/influencing will lead to disqualification of involved participant. Please report cases of vote solicitation or vote influencing to Competition Officer Jing Calonge. Rest assured that your report will be handled confidentially. Like the previous year, we shall have one guest judge for photomeet contests and one guest judge for theme contests. Each judge's votes will count for 10 points for their 1st place picks, 7 points for 2nd place picks, and 5 points for 3rd place picks. Each guest judge will be asked to vote in every photomeet or theme contest for 2019. The competition runs from January until December and encapsulates all Focus contests during the period. POTY is points-based, with members accumulating points based on their activity and performance in contests/activities. All points will be tracked and recorded. The Focus member who has the most points at the end of 2019 will be recognized as Photographer Of The Year. The points and records will not be made available to the public but members will be updated individually - upon request - every quarter as to how many points they have accumulated and what is their current ranking. They will not be given access to other members' stats or standings. Only official Focus Bulacan members will be allowed to participate in POTY. Focus applicants MAY join our contests, but they will not accumulate points to be included in the POTY competition. However, once they become official members, their points in previous contests (during the year) will then be carried over to the POTY scoring. Focus Bulacan officers are allowed to join the contest, EXCEPT the Competition Officer, as standard procedure for our photocontests. Final details of prize options will be announced in the last quarter of a calendar year. For points allocation/system for POTY, please refer above (POINTS ALLOCATION). Ending the year on a high note. Congratulations, Raymond! May this contest victory clinch your membership approval. 1st Place gets an extra 10 points, 2nd Place gets 7, 3rd Place gets 5, 4th Place (undisclosed) gets 3, and 5th Place (undisclosed) gets 2 points for the 2018 Photographer Of The Year competition. Participants automatically get 3 points for submitting entries. THANK YOU TO EVERYONE WHO VOTED IN OUR 2018 CONTESTS! We appreciate each and every one of you. Of course, the biggest thanks go out to our 2018 Guest Judge RICKY LADIA for the year-long honest critique of the entries. Salute, sir! Thus ends the last of our monthly contest this year. The only contest remaining is the Focus Portrait Project 2018, which is open only to members. See you again next year as we begin another round of competition!